With barely a rough sketch of a map, we set out to navigate the winding street maze that forms the Old City. Divided into quarters, it was plainly obvious when we passed from the Jewish Quarter into the Muslim Quarter. The people were all still very nice but also quite different, as were the conditions of the roads, the spray painted decor and goods for sale in the shops. 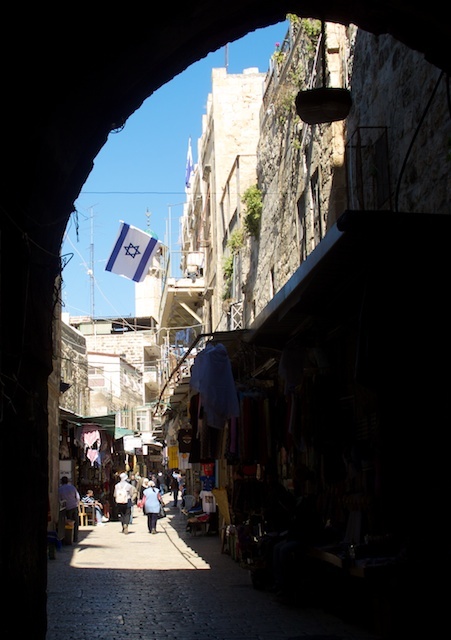 We wandered about both shopping and visiting some of the stations of the cross along the Via Dolorosa – the route that Christ walked from where he was convicted by Pointius Pilate to where he was crucified. This route is extraordinarily popular with the tour bus sect, and we even saw one group of women carrying a 6 foot long wooden cross. 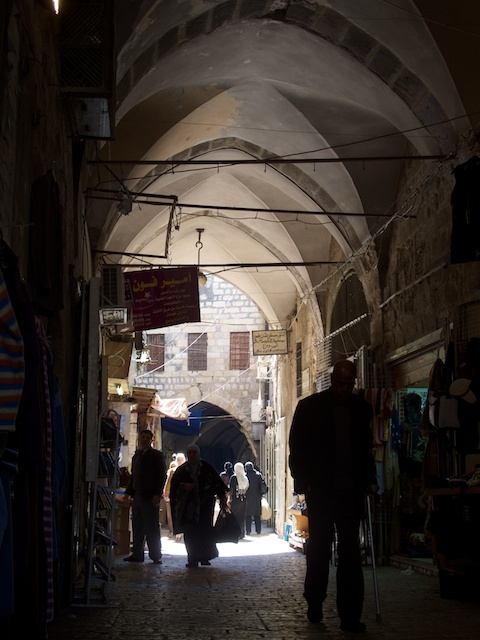 Before we got to Christ though, we got down with some serious commerce along the way as the Via Dolorosa is lined with shops. Nothing has a price on it, everything is a negotiation. My target was usually half of what was originally quoted but sometimes less and sometimes I still felt as if I was being ripped off. 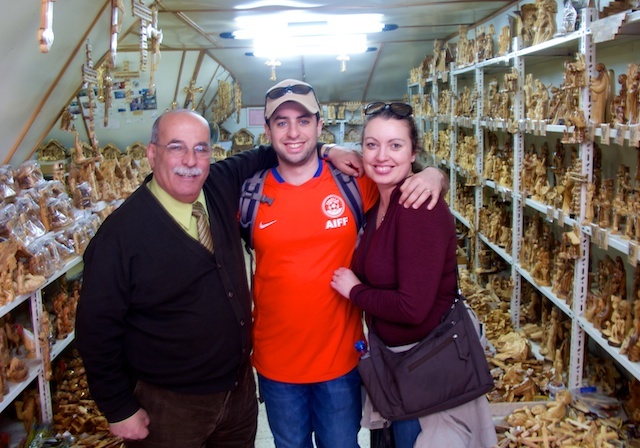 When Jamie bought a beautiful hand carved Nativity made of olive wood, I knew I could’ve pushed the man further, but he was so much fun to negotiate with that I let him have 100 Shekels for it. These merchants compliment and go back and forth negotiating over every last shekel. I kept pushing the price down, walking towards the door all the while Jamie is sitting on eggshells, mortified that I’m pushing. This is the great fun of shopping in the Souk and purchasing all the different trinkets, not a sign of disrespect or poor manners. The highlight of our shopping was finding the Elia Photo store. I walked in to find it decorated with vintage black and white prints from the early twentieth century and instantly recognized a smell from 15 years ago. Fixer. Fixer is a chemical used to print B&W with a vaguely toxic aroma. Amazing coincidence how my Grandfather had been in prayers only hours earlier and now here he was in the air as I fondly recalled Saturday’s spent in his darkroom. 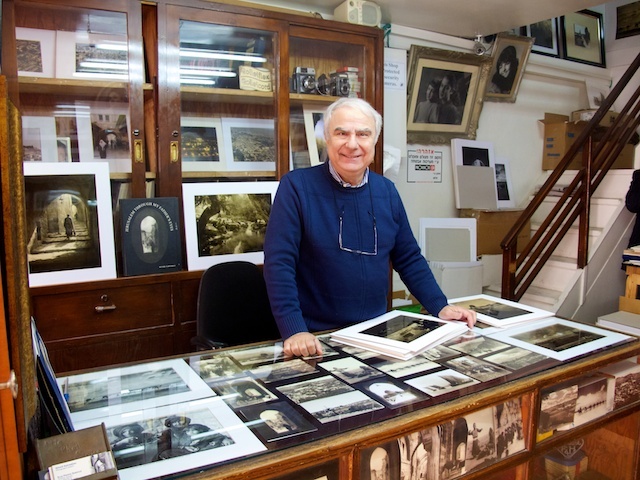 Every print in the store was taken by the owners father and printed by hand. It took a while, but we eventually settled on two beautiful prints on a metallic silver paper that shines brilliantly in the sunlight. 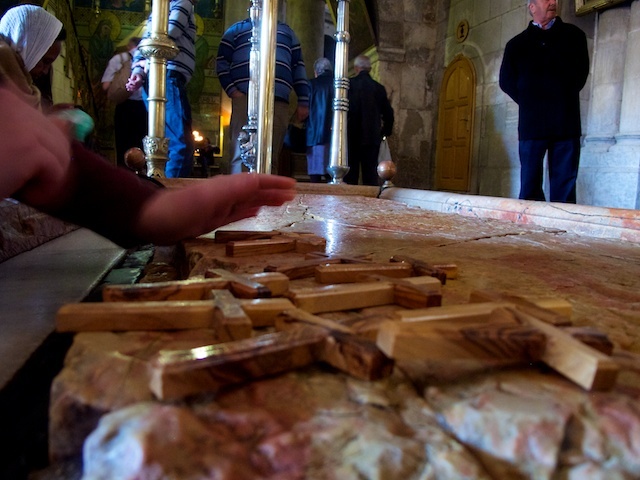 After walking the Via Dolorosa we eventually arrived at the Church of the Holy Sepulcher. I like visiting old churches. 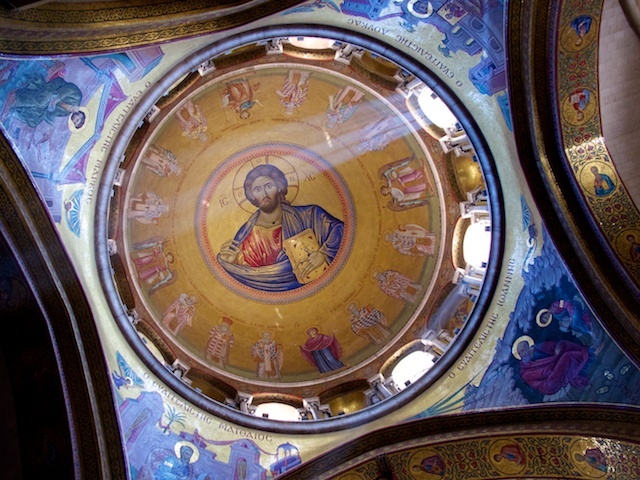 Some of the paintings and mosaics where magnificent. This is where it is believed by some religions that Christ was entombed. The Church is a slightly confusing maze, at least as far as churches go. One room had a very high ceiling with a beam of light shining through. We declined to enter Christ’s Tomb as the line was at least an hour or two deep. After, we walked back to the Jewish Quarter for a lunch of traditional street foods. 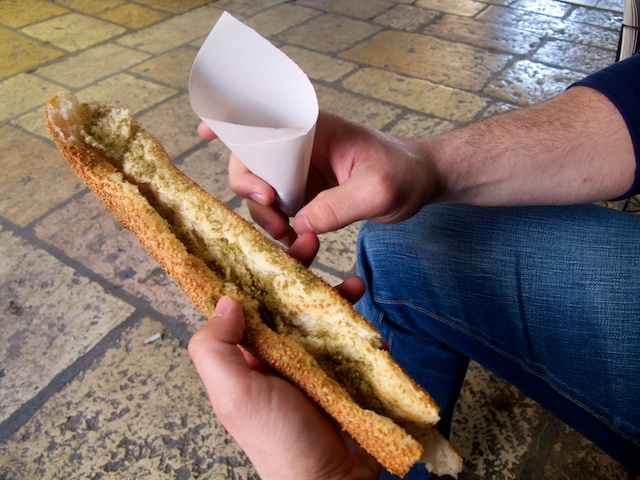 Eating Falafal was the quintessential street food moment that you would see on the Food Network. It was fun to be there during school recess with kids crowding around to order lunch. Then we had a big bagel with Zatar, a local spice. (Thank you, David Lander) And then we had a little more pastry. Don’t worry, we also did a ton of walking. After lunch, we returned to the Wall area to find the infamous line for the Temple Mount [see previous post] non existent and went up to view the Dome of the Rock. This mountain top is roughly the size of 20 football fields and was flattened to build the Second Temple almost 2000 years ago, where the Ark of the Covenant was believed to be held. [Pardon me if I’ve gotten any of the history wrong.] The temple was later destroyed and Mount was taken by the Muslims who built the Dome of the Rock, which can only be entered by Muslims. 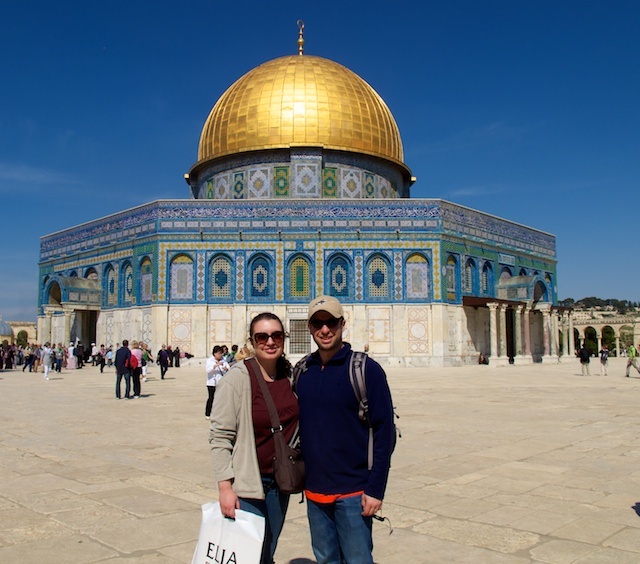 We sat quietly from a distance taking in the splendid gold domed roof that is seen in so many Jerusalem photos. Although I think we broke the rules because one minute we were holding hands and the next a man came over, yelling and told us it was time to go. We have tried to be very respectful of all the customs, but we an affectionate couple from San Franciso who finds it hard to relinquish the PDAs. Exiting through the Jaffa Gate our legs were dead tired and thoughts of a cab home sounded good. However, we were at the entrance to the Rampart walk! Ever wonder what it felt like to guard a castle and walk the ramparts gazing out over the land below? Me neither, but suddenly I was. Fortunately they’ve added steel rails and bannisters, but even still it was high and a bit nerve wracking at times for a boy who occasionally fears heights. It was worth it though and we got some good pictures. After a nice late afternoon siesta, a vacation must, we went for yet another fantastic dinner, dining on more Israeli food at Ima. We had a Kebbah, (sp?) which is a hearty soup with dumplings along with stuffed eggplant and some tasty lamb. We decided to pass on dessert and thumbed a cab home. Everythings sounds amazing. It is bringing back memories of our trip in Aug. Looking at your pics and reading your comments I wish I was there again. It was truly the best trip we have ever taken. When you go to Tel Aviv you must go to the palmach museum. It is a must. I will be disappointed if you don’t. Keep the e-mails coming. nice episode. you know of course that it was your great grandfather with the religion and your grandfather with the fixer. it is so cool that eddy k is following this blog and that he skied with george. keep it coming as everyone loves it. Yes, Eddie is amazing. I am so grateful for all of his encouragement in many aspects of my life, as I am to you as well. I am glad that everyone is enjoying my trip and writing as much as I am. Jamie jokes that she likes going to sleep to the sound of my keyboard clicking away.